Have a great week and I'll see you soon! Love it! I need false lashes! Love too! Thanks for sharing!! Jen! can you do a tutorial on eyeshadow placement as i have problem applying the shadow - either too much or too little for me.. It's such a good game, I would think it wouldn't be too unusual to play it! I do get *very* excited about playing though. I always go for longest road. You know what I mean, right?!!! Thank you for the video. I have a couple of questions I wonder if you might have some advice: 1. How do you get face color to long longer? I have combo skin - it's REALLY (peely) dry around the nose, and uber oily T-zone. AND, I am a huge sweater. I sweat a lot even in the cooler weather when I move about. I dislike powder foundation, coz it always looks cakey on me; love the Neutrogena Healthy Skin Enhancer tinted moisturizer but there isn't enough coverage; find using primer and liquid foundation to be un-breathable. I'm in Hong Kong right now, where it's really humid (in comparison to Nor Cal). I've been blending bb cream with Bare Essentuals' Mineral Veil, and found that to give a pretty good matte coverage. But since I'm often blotting off sweat and oil, all the spots where concealer go gets wiped off quickly. Rest of the face is okay. If I re-apply power, dry parts gets flaky-looking; if not, my skin tone is uneven. Such dilemma! 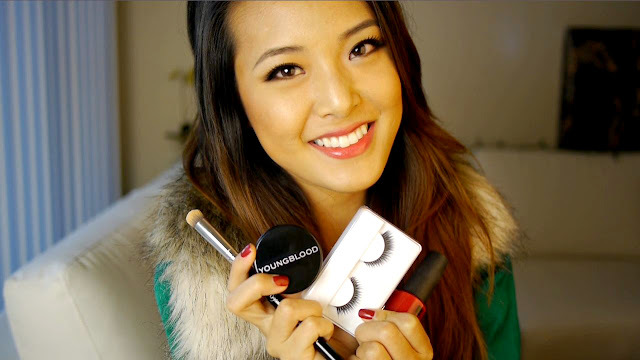 Are you able to purchase the Holika Holika lashes at a store in LA or San Fran? I'll be heading there this week :) Very excited! I love your eye makeup in this video!!! Is it a look you previously made a video on? Hi Jen! How does the Youngblood Mineral Foundation compare with Everyday Minerals? Hi Jen! Do you think you could do a tutorial for this look! It's gorgeous and I love the slight smokiness. Hi Jen, love your makeup and hair in this video. Very pretty. Please tell us about your hair colour, I want something similar but do not know how to go about it. Hi! I was wondering what size/number of Holika Holika lashes you were talking about in your video? Cause I clicked on the link you posted, but then it listed diff types of them. Thanks! Happy November Jen. The nail polish are absolutely gorgeous. Hi Jen! A bunch of people already requested this but I would love a tutorial on the look your wearing in this video as well! It's gorgeous! Hi ! I'd love a mineral foundation routine and I was wondering if you just skip the concealer step when you use your Sigmax P82 brush. Thank you for your helpful videos. Could you do a list of what you're planning to haul for the Sephora VIB sale if you are going to? Hi Jenn! Could you specify which kind of Holika Holika lashes you use? Each pair seems to have its own number. Which do you use? And yes, I have always found links from the blog to be very helpful. Actually just ordered the Shiseido curler to see how it measures up to my old Tweezerman Procurl. Hey Jen, cute faux fur vest! I've been trying to find one like it. Where did you get yours?